Hook and William Smee discuss the boy that they found. Hook suspects the boy they rescued from the ocean may be the Dark One’s son. Hook and William go to the boy’s cabin. Hook’s suspicions are confirmed once he learns the boy’s name is Baelfire. Hook gives Bae a blanket and welcomes him aboard. William pleads with Hook to turn Bae over to the Lost Boys. The Lost Boys are searching for him and this has William nervous. Hook does not want to give up Bae. The Lost Boys come aboard the ship and Hook lies telling them there are only men and no children. They search the ship. The leader of the Lost Boys searching for Bae warns Hook if he is lying his shadow will be ripped from his body. Meanwhile, Bae hides as they continue to search. The Boys find nothing and leave. It is day. Bae walks the ship. Hook tells him he is impressed how well he handles himself. He teaches Bae how to steer the ship. Hook asks Bae what happened with his father. Not knowing Hook is enemies with Rumpelstiltskin, Bae confides in him. He tells Hook that his father is the Dark One and his father chose power over him. This is how Hook learns of the dagger. Later William again pleads with Hook to give up Bae. Bae comes out wielding a sword and a drawing. He attacks Hook. Hook easily disarms him but wants to know what is wrong. Bae shows him he found a drawing of Milah. He accuses Hook of being the pirate who killed his mother. Hook explains to Bae that his father lied to him. He tells Bae that he and Milah fell in love and it is actually Rumpelstiltskin who killed her. Bae then accuses Hook of ripping their family apart. Hook tells Bae that Milah wanted to come back for him so they could be a family. He wants Bae to stay with him so that he may right a wrong and they could be the family Milah would have wanted. Bae tells him he wants to leave and go back to his father. Hook tells him he can never leave Neverland. Hook later tries to stop a determined Bae from leaving. Bae tells Hook that he does not believe he could change and is only out for himself. This angers Hook who tells him he will continue his mission to kill Rumpel. They Lost Boys come on board the ship and Hook does not stop them from taking Bae. He scratches off a letter embedded on the ship. The Lost Boys tell Bae they are not going to kill him. Once out of sight the leader and another Lost Boy talk. Bae may not be the right boy. We find out that the Lost Boys work for Peter Pan. The leader shows a picture of the boy Peter Pan is seeking. The drawing is of Henry. A man is washed up on the beach. Mulan and Aurora run over to see if he is alive. They flip the man over. It is an unconscious Neal. Mr. Gold watches Henry on a swing. He points the tip of his cane toward Henry. The rope holding the swing begins to unravel. Before anything happens Gold is interrupted. David asks him what he is doing there. Gold bitterly explains that Neal wants nothing to do with him so he was watching Henry. Mary joins David and they tell Gold there is something he must know. He is disinterested and tries to walk away. They stop him and tell him that they believe Neal is dead. They explain how Tamara and Greg were deceiving everyone and Tamara shot Neal before sending him down a portal. Mr. Gold is devastated. 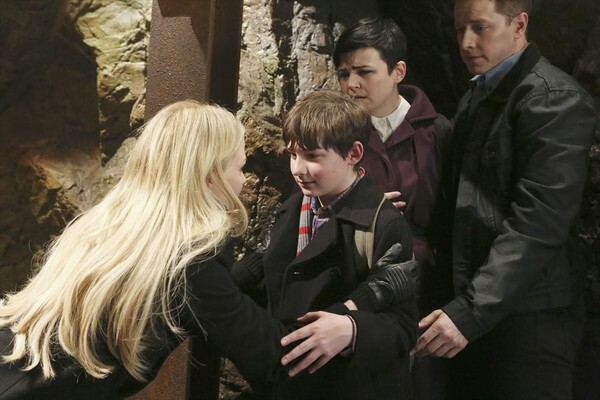 At the same time Henry embraces Emma as she delivers the news to him. Mary and David plead with Gold to help stop the trigger. He tells them he deserves to die for getting his son killed by bringing him there and does not want to help. Hook walks through the mine with Greg and Tamara. They show him the diamond and explain it will end Storybrooke. They tell Hook they are willing to die for their cause. He asks who they work for. They admit that they do not know but believe in the work. They ask if he cares enough about vengeance to die for his cause. He tells them he does. Greg grabs a dwarf’s ax and hits the diamond. The trigger is active. They exit the mine. Outside an ominous vine begins to surround the clock tower. I wake up and feel the ground shake. I know that the trigger has been activated. Mary, David, Emma and Henry come home. I tell Henry that he will live because he was not born in a different world. Hook enters the apartment and David punches him. Hook does not fight back but instead tells them he does not want to die and is there to help. A plan is devised. Emma will go with me to the mine so I can try and slow down the diamond. David and Hook will try to find Greg and Tamara so they can get the magic beans back and open a portal to get us out of Storybrooke. Before I leave I tell Henry how much I love him. I apologize for not being the person he wanted me to be. Henry tells me he loves me too. Gold finds people in his shop. Leroy tells him that Mother Superior has been working on an antidote for memory loss. She has created one and he will give it to the one dwarf who still has his cursed memory for being pushed over the Stotybrooke line. He tells Mr. Gold that there is an extra one for Lacey/Belle. After the people leave the shop Lacey comes out and asks Gold what was going on. He tells her nothing. Hook takes David to Greg. They sneak into a building. They catch up with Greg and David points his gun on him. He demands the beans. Tamara interrupts by shooting at David. David goes after her as Hook and Greg fight. Greg and Tamara get away but Hook has managed to secure one of the beans. He shows it to David and tucks it in his pouch. In the mine I explain to Emma that once the diamond runs out of energy we will be out of time. I tell her that to slow down the device it will require all of the energy. Emma realizes that I plan to die to save them. She does not want it to be that way. I explain that I do not want Henry to remember me as the Evil Queen and this is what I must do. Emma tells me there has to be another way but I start my redemption. I use my magic to connect to the diamond to slow it down. Emma leaves. The vines continue to grown. Gold and Lacey have a drink. She spills alcohol and goes to use Bae’s shawl to clean it. Gold is upset and stops her. She apologizes. Gold realizes she must know the truth. He brings out the broken teacup and uses magic to put it together. She does not understand what is so special about the teacup. Gold pours the blue liquid from the vile he received from Leroy into the teacup. Lacey regains her memory as Belle. They both cry. Mr. Gold tells Belle that he has failed. David and Hook go to the Diner. Everyone cheers when they find out a magic bean has been recovered. Henry asks about me. Emma admits to him that I chose to save everyone and not join them. Henry is upset. Mary comes up with an idea. They will use the portal to get rid of the trigger. Emma argues that this is too risky. Archie steps in and tells them that this is the right thing to do. Emma finally agrees to the plan. Hook is not on board. He tells them he does not want to take such a chance. Emma tries to appeal to him and he seems to agree. He turns over the leather pouch that contains the bean. Hook wants to know why Emma is agreeing to this. Emma tells him that Henry’s father was killed by Tamara. A confused Hook asks who Henry’s father was. He is stunned to learn that Neal is Baelfire. The group heads to the mine. They tell me their plan and I try to discourage them. They insist they must try to send the diamond into a portal. Emma opens the pouch. It is empty. Meanwhile, Hook has set sail on his pirate ship. On the ship Hook thinks about what Emma told him about Neal/Bae. He stares at the magic bean. I am losing my energy. I tell them I do not think I can contain the diamond much longer. Mary, David, Henry and Emma embrace. I see Henry looking at me. He comes over and hugs me. I cannot hug him back because I am still holding on to the energy of the diamond. Emma has an idea and tells us she thinks she can help. Emma joins me. She musters up her own magic and tunes into the diamond. Our magic together is powerful enough to turn off the trigger. Storybrooke is saved and everyone rejoices when they are still alive. We realize Henry is missing. Greg and Tamara have taken Henry. Greg tells him that they have come to realize he is more important than ending magic. They create a portal in the ocean. We see them and try to catch up. We are too late. They jump in the portal and it closes. Mr. Gold has arrived with Belle and we plead for his help. He admits without a magic bean there is not much that can be done. Emma looks ahead and sees a ship heading to us. Hook has returned. He has come to help. He and Gold will set aside their differences. Gold tells Belle that she cannot come. Belle tells him she believes he will not come back. Gold tells her he fears more people like Greg and Tamara will come to Storybrooke. He hands her a parchment and tells her to use it once they are gone. Gold explains that Henry is his grandson and in honor of Bae he must save him. Belle tells him that she will see him again. She passionately kisses Mr. Gold before he leaves. Once on the ship Mr. Gold creates a magic globe. A red form appears. Hook tells them that he can read it. He solemnly tells everyone that Henry has landed in Neverland.